An Interview With JONATHAN SCALES All About His Forthcoming Sixth Album, PILLAR! 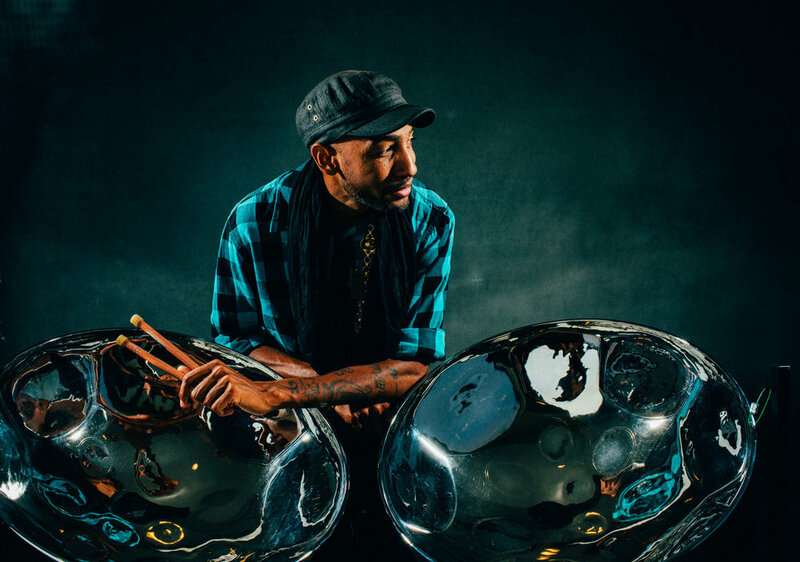 Get to know the Asheville-based musician, Jonathan Scales! 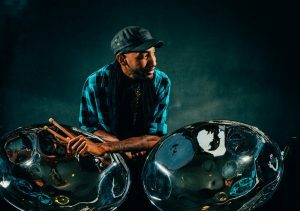 Jonathan Scales is one of the most innovative steel pannists on the planet, and is redefining and challenging traditional expectations of his signature instrument. In his hands, the sonic palette of an instrument often associated with cruise ships and tropical resorts is radically expanded to mimic the role of horns, piano, vibraphone or marimba due to his stunning, virtuosic technique. He’s got a new album coming out featuring a pantheon of top-notch players, many of whom Scales grew up listening to and idolizing. Scales’ upcoming release, PILLAR—his sixth album, and fourth release on taste-maker label Ropeadope—is a testament to the grit and tenacity he possesses. The record features an incredible cast of special guests, including banjo pioneer Béla Fleck, bassists Victor Wooten, Oteil Burbridge and MonoNeon, trumpeter Christian Scott, Tunde Adjuah, saxophonist Jeff Coffin, keyboardist Shaun Martin and percussionist Weedie Braimah. PILLAR will be released on September 14th. I’m at my home, in the Asheville, NC area…off the road for a bit, until the new album comes out. I’m kind of a work-a-holic, so today I’m planning to catch up on a lot of the business stuff I couldn’t take care of while I was on the road…like this interview! The answer for this might seem unfitting with my music if you don’t know me well…I’d have to say my summer song of 2018 has been “Dinero” by Jennifer Lopez…really because me and my lady blast it at home and act crazy & just have fun, so songs like that are like sonic time-markers in life for me! Honorable mentions to “Apes**t” by Beyoncé & Jay Z. 2018 has definitely been a challenging year of rebuilding. From rearranging the Fourchestra, recording the new record, and just keeping the business going ahead of the new album dropping. One goal I had this year was to work with Béla Fleck…been dreaming of that for 15 years! Got to check that one off the bucket list! I have always strived for creating music that has a palatable but ear-piquing vibe and keeps listeners on their toes. Sometimes that means the music is complicated to play yet still enjoyable to the “average listener”. My approach remains the same, but I do feel like I’m finding my perfect balance between complex & palatable. Let’s talk about your upcoming release, “PILLAR.” What was the inspiration for this collection? How do you think these songs and this overall album show your growth as an artist? How differently did you approach this collection compared to your previous ones? The inspiration behind the music on PILLAR comes from the idea of having to try to remain strong while everything seems to be crumbling around you. In the process of trying to be strong pillars in our lives, there are the trying moments, the triumphant ones, the rebuilding phases, and everything in between…to me the music on PILLAR is the soundtrack to that idea. In terms of growing as an artist & my approach, I feel like this music might be more palatable to a general audience than some of my earlier work while at the same time having the complex inner-workings that will intrigue the scholars. How did you go about choosing the musicians that you worked with on “PILLAR”? What was it like working with them all? I wanted my core, touring band to be heavily involved because they are the ones that will be out on tour with me and it’s always nice when the audience can walk away getting to know the players they just saw on stage. In terms of guests, I really just envisioned artists that I felt would help bring the music to life and then just tried my best to actually get them into the studio! To have Béla Fleck, Victor Wooten, Oteil Burbridge, MonoNeon, Weedie Braimah, Shaun Martin, Jeff Coffin, & Christian Scott aTunde Adjuah all on the same album and adding SO MUCH of their own voices to my compositions is really a dream come true. I feel very solid about the outcome. While it’s difficult, can you pick out a few of your favorite songs on “PILLAR” and elaborate on the inspiration for them? How did they get to be on this album? The opening track is one of my favorites. “Fake Buddha’s Inner Child”. The inspiration for writing that one was all about finding some kind of inner peace to keep those dangerous, emotionally immature responses to crisis in check…It’s a meditation of sorts. I shut myself in a little, sound-proofed practice room on a snowy day and didn’t come out until I had completed the composition. It’s crazy for me to look back on that day, and being in that head space to now hearing it with Oteil Burbridge playing over the strings & singing that melody that I wrote in such a crazy time of my life. Back in the day, artists were really isolated from their fans, so the whole social media thing really has changed the game. I guess I’m still considered to be a “millennial”, so it’s just kind of part of my daily life to stay connected with the fans in that way. I like to show a little bit of my “real life” other than just promoting the music…I feel like that really goes a long way to help audiences feel connected to you, especially if you’re being genuine. Béla Fleck, Eminem, Björk, Thundercat, Kanye West, Bach, Miles Davis, Danny Elfman. I would love to work with Thundercat on something one day! Between you, me, and anyone else reading this right now, I actually reached out to Thundercat’s people about having him as a guest artist on PILLAR 🙂 Didn’t happen, but hey maybe next time! I’m always reaching to push my own limitations. A solar-powered device with headphones that had a ridiculous amount of albums stored on it’s hard drive. Well…when it comes to TV shows, it’s really all about licensing…and we all know that licensing can make good money for a composer….so let’s say something huge….like Game of Throne or The Walking Dead! In all honestly, I began my career in music wanting to do film scores…I can’t think in terms of “what movie I wish my music was featured in” because it’s already done! I do want to do more along those lines in the near future though. I hope fans just take it for what it is….it’s just sound. And if my sound resonates with them for whatever reason, that’s really cool. And if not, that’s also fine. That might sound really vague, but I’m a big fan of the composer & music theorist John Cage…learning about him really changed my perspective on how to perceive other people’s perspectives.